Because it was minus two when I awoke one February morning, I decided not to go ice fishing as planned. Minus two, I reasoned, might damage my truck’s engine block and my block as well, so I made a cup of tea, read the newspaper and pondered the situation. I may get fewer crappie from tip-ups and shiners but those I do catch are likely to be hefty. The weather man said it would be plus 20 by 2 p.m. with little or no wind. And since it was late in the month, it would still be light until after six. In my estimation both my truck and I could handle those conditions. After choring around the house most of the day, I finally got going around 2, arrived on the ice a half-hour later and by three had a bunch of Swiss holes in the cheese. Early on the bluegills were hitting okay, then around four a few trout got active and soon after the crappie really started hitting. I had a great hour or so of ice fishing for crappie until I pulled up stakes with only a pale glow of orange light left in the sky. Spoons in the 1 to 1.5-inch up to 2 to 2.5-inch modes work great late in the day for spooning up crappie. That year the thermometer registered zero or less so many times when I woke I didn’t feel like going out, however I did this late-afternoon thing a number of times and it was fine. Happily this delayed daytime ice fishing goes hand in hand with the late-ice season. Depending where you are fishing, the timing can vary by several weeks. But there is a constant, and that’s the attitude of the crappie. 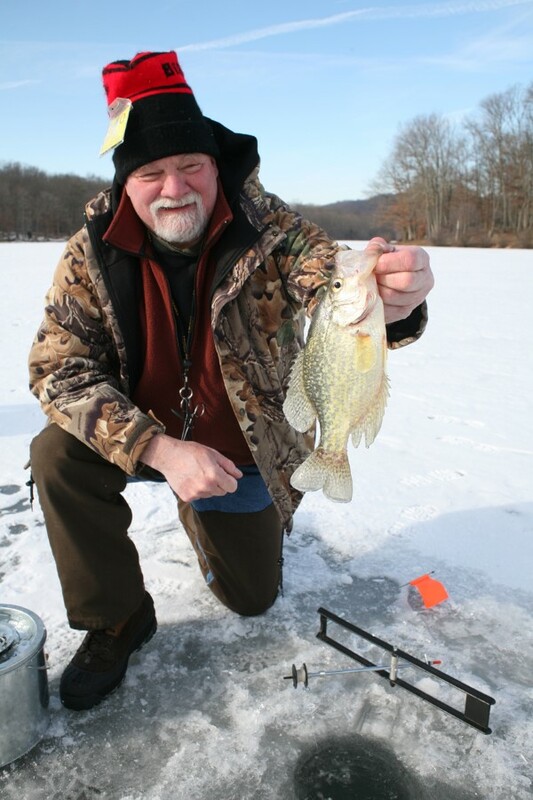 Depending on winter’s grip — firm or relaxing — crappie are moving to the shallows at this time. Basically they’re heading to where they’ll eventually spawn. But crappie just don’t pack their bags and stay in the shallows – it’s still too cold for that. They move back and forth over the course of a day whenever the spirit inspires them, and they’ll certainly depart from the shallows when things don’t suit. Even under the ice it’s a fluid situation. But whenever crappie do travel to shallow water they are hungry. No bones about it. Find them in this situation and 99 times out of 100 they’re going to eat. That’s why my number one tactic during the late-afternoon season is to check out and fish shallow water. Staying into the night can produce some excellent crappie fishing at this time. On some lakes with extensive weed beds, the shallows can be water as little as three feet deep. On other waters shallow-staging crappie are in four-to-seven feet. Elsewhere the shallow sections are the submerged points off banks and entrances to bays and coves. Depths there are six to twelve feet. It seems each lake has its own set of rules, but the constant is that late in the day crappie are moving up. When setting out for late crappie, it’s important to have a feel for the lake you’re fishing. Lakes with very large areas of shallow water that hold winter weeds will probably see the best crappie bite. Lakes lined more with deep drop-off banks and not much shallow water will most likely have the poorest bite. Also it is much easier to target extensive shallow flats where you know crappie will eventually go to spawn rather than to try and find crappie over an extensively large basin with, percentage-wise, very little water under five or six feet deep. But if the lake is mammoth with mammoth shallow flats as well, this is a place to pay attention to. The moral is pick your late-ice season lake wisely. As for technique, late-rising crappie might require one adjustment that early or mid-ice season didn’t demand. Often the shallowing crappie are accompanied by yellow perch. If the perch are a nice size that’s a good thing and you fish for both at the same time. But it often seems that the first yellow perch to move into the shallows are small finger-size perch. These fish have a way of ganging up on small baits. If you’re having one of those days that you’re saying, “I can’t get the bait through all these pesky perch” then try making an adjustment to larger baits. Most of the ice year I’m fishing crappie with 1/100, 1/64 and 1/32 ounce jigs and trailers but when finger perch or small bluegills are around I bump my jigs through the 1/16, 3/32, 1/8 ounce range. Also the spoons I like for crappie go from 1 and 1 1/2-inch models to 2 and 2 1/2 inch models. And when using tip-ups, I switch out the shorter fathead minnows for 2 1/2-inch shiners. I’ll probably never figure out that if by using larger lure size I’m just avoiding the strikes of the smaller perch or whether I’m actually copying the perch size crappie may be taking. Cleaning some crappie I’ve sometimes found perch in their gullets other times it’s the typical larva crappie eat so it could go either way. On another note I know I’m going to get fewer crappie from the tip-ups and shiners but those I do catch are likely to be in the 14-to-15 inch range. 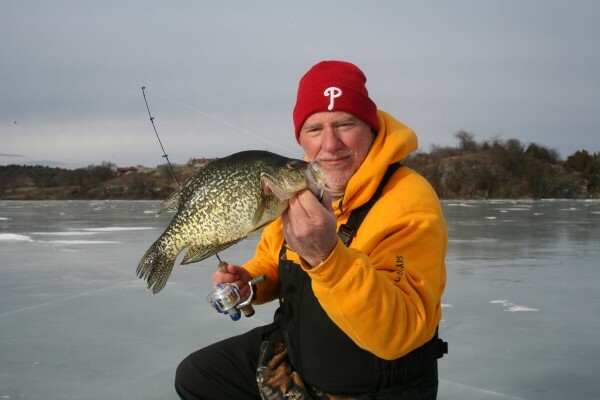 Unlike the deep-basin crappie of mid-winter, shallow crappie are there to eat. Sure they have turn-off times but more often when you’re not catching fish it’s because they’re circulating. You have two choices when this happens, either drill more holes and go look for them or sit it out where you are and wait for them to come back. Often I’m impatient (or just too cold) so I chase them with my Vexilar. 1-In February crappie are basically heading in fits and spurts to where they’ll eventually spawn. 2-Crappie move back and forth over the course of a day whenever the spirit moves them. 3-Whenever crappie travel to shallow water they are definitely hungry. 4-The number one tactic during late-afternoon is to check out and fish shallow water. 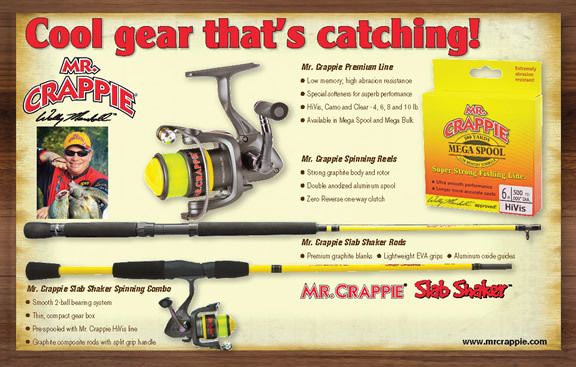 5-When setting out for crappie, it’s important to have a feel for the lake you’re fishing. 6-Lakes with large areas of shallow water that hold winter weeds will probably see the best late-season crappie bite. 7-It is much easier to target extensive shallow flats where you know crappie will eventually go to spawn rather than to try and find crappie over an extensively large basin with deep water. 8-Most of the ice year I’m fishing crappie with 1/100, 1/64 and 1/32 ounce jigs and trailers but when fishing the late season in late afternoon I bump my jigs into the 1/16, 3/32, 1/8 ounce range. 9-In the late season the spoons I like for crappie go from 1 and 1 1/2-inch models to 2 and 2 1/2 inch models. How to attract these shallow late-day crappie to your chosen bait really isn’t hard. For lure action I like to impart tiny little waves on my rod tip, lightly bouncing the tip continually, or bouncing it and pausing. At this stage of the game, really exaggerated rod and jigging motions are not necessary. Then again, dead sticking a jig or spoon, even with larva bait, may not produce as many as a lure doing the wave. All sorts of colors are viable for late-ice crappie but after years of playing this game I’ve figured something out. The better flats are soft-bottomed and so the water at bottom level might be a tad murky. It looks clean on the surface but when you view it with a camera it’s full of silt and slightly stained. For this reason I like high-contrast colors, pink and white, chartreuse and lime, black and white, and for spoons gold and some hot color such as fluorescent red or yellow. Another good producer are the minnow-shaped ice jigs with hooks at the head, tail and bottom. Add a bite of perch belly or a perch head to these odd lures and you have a real winner for shallow later-afternoon crappie. Don’t worry that the addition ruins the balance of the lure; it doesn’t matter. When it comes down to it, I’m enjoying a nice morning in a warm house and a few hours of better fishing in a warmer afternoon. 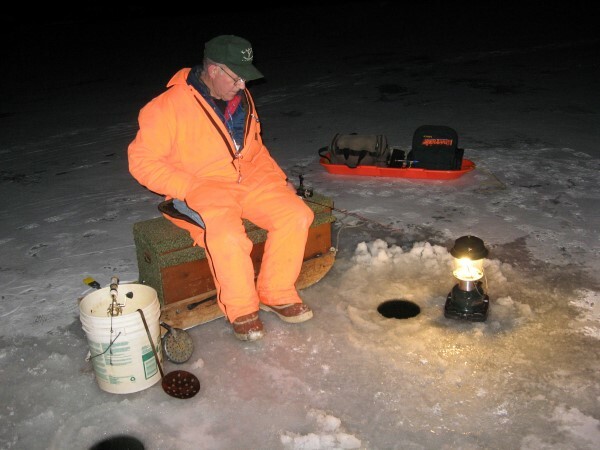 You may not think that 20 to 30 degrees is warm, but for an ice fisherman, 20 is exactly that.